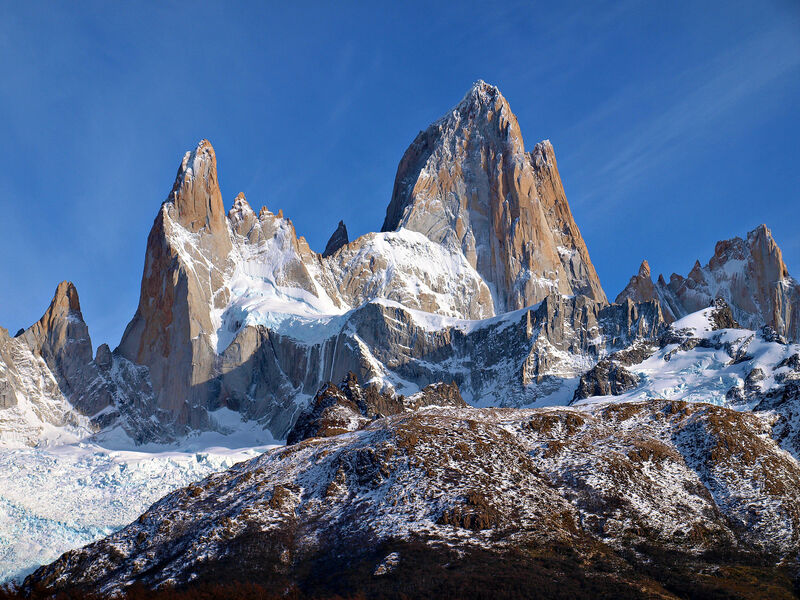 Jim Reynolds’ free solo climb of the Fitz Roy marks the iconic Patagonian mountain’s second ever free solo. Look at the iconic Patagonian skyline — yes the same one on the American brand’s logo — and one mountain sticks out: the Fitz Roy. In climbing history, only one person has managed a free solo of the mountain. Until now. Jim Reynolds, 25, from Weaverville, Calif., climbed the 5,000-foot Afanassieff route on Fitz Roy on March 21. The route is rated 5.10c, and it took Reynolds 15.5 hours. For context, sheer granite climbs of this length are few and far between in the entire world. Yosemite’s El Capitan only reaches 3,000 feet. And to free solo such an expansive piece of rock is absurd! National Geographic broke the news of his ascent today. It marks one of the most impressive free solo climbs of all time. While National Geographic claims Reynolds’ ascent is a free solo, he did bring a short rope and some climbing gear with him. “His aspiration, of course, was that he would use neither rope nor gear, on the way up or down. Nothing more than climbing shoes, a bag of chalk, and skill,” writes Andrew Bisharat. Nowhere does the author mention Reynolds’ use of gear — a suggestion that this ascent was indeed a free solo. On his attempt, Reynolds left his harness and belay device at home. Along the climb, Reynolds encountered a sketchy smooth pitch of slab climbing, blocks of ice raining down on him, and a section where he needed to switch to crampons and ice axes. The only other time the Fitz Roy was free soloed was by the late Dean Potter in 2002. Potter climbed a route called Supercanaleta. Reynolds’ ascent differs from Potter’s in that Potter rappeled off and climbed a different route. To remember the route down, Reynolds built cairns on the way up. This means Reynolds had to downclimb difficult pitches of 5.10 rock. And he did this at night! In all, Reynolds summited at 3:13 p.m. after 6 hours and 38 minutes of ascent. He spent the next 9 hours descending the route. Reynolds, a Yosemite Search and Rescue employee, does not have the pedigree (or fame) of other notable free soloists. In 2017, Reynolds set the speed record on the Nose in 2 hours, 19 minutes, 44 seconds. Reynolds climbed with Brad Gobright to set the record only to later lose it to Alex Honnold and Tommy Caldwell. But other than that, Reynolds has largely stayed out of the limelight despite some serious accomplishments. According to National Geographic, Reynolds also free soloed the West Face, 5.10c, of Rafael Juarez in March. He also free soloed Chiara di Luna, a 5.11a up Saint-Exupery.